Hyundai’s Elevate ‘walking car’ concept emerged as an automotive highlight of the 2019 Consumer Electronics Show (CES), held recently in Las Vegas, US. 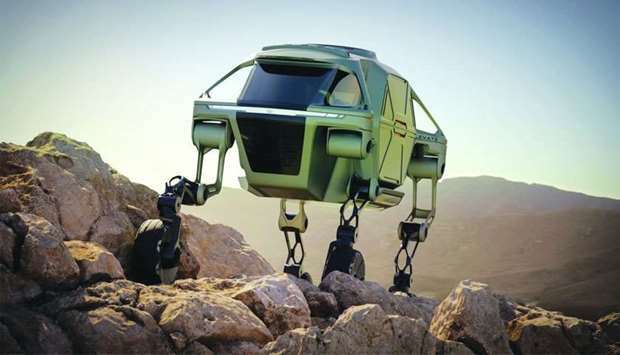 Described as the first Ultimate Mobility Vehicle (UMV), the design blends technology found in electric cars and robots, allowing it to traverse terrain beyond the limitations of even the most capable off-road vehicle. The concept is primarily designed to provide efficient, rapid, resilient transportation for disaster assistance, such as search-and-rescue and humanitarian aid missions. Wheels with hub-mounted electric motors are attached to extendable robotic legs, so the vehicle can drive, walk or climb over obstacles, according to a press statement issued in Doha by Skyline Automotive, a Jaidah Group company and official distribution partner of Hyundai Motor Company. At CES, engineers have used a working scale model to demonstrate the design in action. A full-size version could climb over obstacles 1.5m tall, or stride across a gap 1.5m wide. A variety of different bodies can be swapped on and off the modular chassis, depending on need. “When a tsunami or earthquake hits, current rescue vehicles can only deliver first responders to the edge of the debris field. They have to go the rest of the way by foot. Elevate can drive to the scene and climb right over flood debris or crumbled concrete,” said John Suh, vice-president and head of Hyundai CRADLE, the carmaker’s venturing and open innovation business. Elevate is the result of almost three years’ work in collaboration with industrial design consultancy, Sundberg-Frear, as part of Hyundai’s mission to create new ‘last mile’ mobility technologies and solutions. Elevate’s engineering features include robotic legs with five degrees of freedom plus in-wheel propulsion, the ability to walk in mammalian and reptilian style gaits for omnidirectional motion, the capability to climb a 1.5m vertical wall, step over a 1.5m gap, non-back drivable motors enable the legs to lock in any position and a modular electric vehicle platform. Elevate is a product of Hyundai’s future mobility roadmap, showcased at CES 2019, highlighting the company’s strategy to create freedom in mobility for customers.